WOD at Home | Full WOD programming for the home or garage athlete. 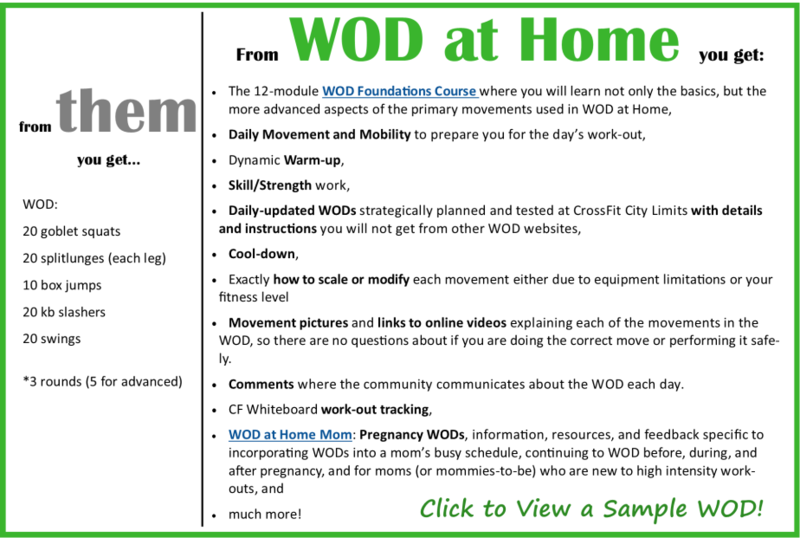 Become a member of the WOD at Home community for access to the WOD Foundations Course and the daily updated workout program. Get back to the basics. Take the time to learn to all the foundational WOD movements properly and take your WODs to the next level! What is WOD at Home? We are NOT a create your own WOD, choose your own WOD, pick a random WOD site where you may not know exactly how to perform a particular movement or understand what an abbreviation is. We ARE a team of coaches committed to providing you with daily work-outs strategically planned by CrossFit Level 1 Trainers and tested with specific programming in mind to give you the randomization and customization you would find in a gym. Although they may seem random, years of experience and collaboration goes into the order and types of work-outs provided to maximize results. We ARE redefining WOD websites to go beyond a basic daily work-out. 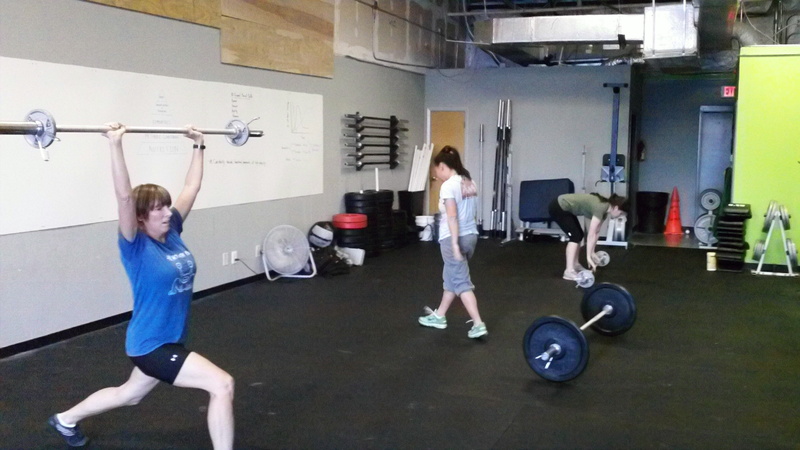 We provide training on the basic movements through our WOD Foundations Course. Every day of the year, we provide you with a dynamic warm-up, skill/strength work, daily updated WODs with details, instruction, helpful tips, scaling and modification suggestions, equipment substitutions, as well as movement progression images and video instruction links, and a cool down. NO REPEATS. We ARE a community of people who work-out from home for various reasons, share our achievements, and provide support and encouragement. We ARE committed to customer service and your health and wellness and are available to answer any questions you have or provide feedback. ALL right at your fingertips. WOD at Home is a workout program or weight training program based around functional exercises that translate into real world activities. It is for EVERYONE!!! It will challenge the professional athlete as well as provide a great, scaled workout program or weight training program for your anyone trying to get into shape. No more wasting your time and money in a globo gym on the elliptical (when will you ever run like that in real life?) or on the shoulder fly machine (really?) and wondering why you are not in good shape. No more early morning boot camps or trying to fit fitness classes into your busy schedule. Turn your overall wellness around and become the athlete you were meant to be. Lose weight, gain lean muscle, tone your body all from home. Run half-marathons because you feel like it without specifically training for it months before. Do that local mud race all your friends have been yammering on about without a second thought. Increase your performance in your club league, whatever it may be. Look good and feel good with minimal equipment form home without ever having to step foot in a gym. 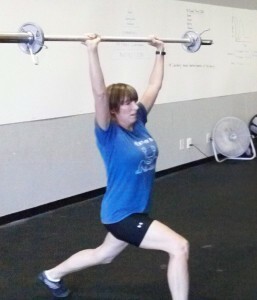 Check out a Sample WOD to see the difference WOD at Home will make in your work-outs! 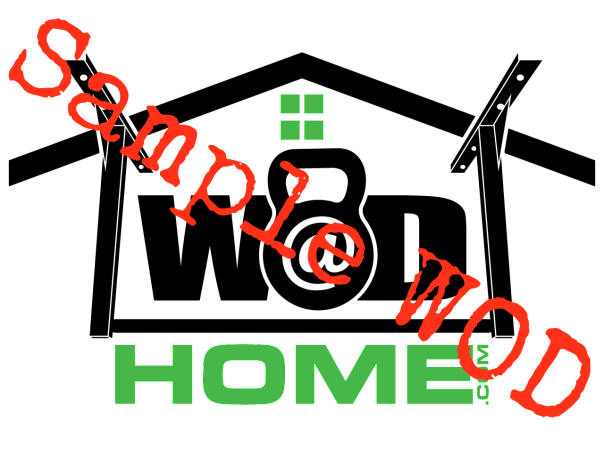 WOD at Home is in no way affiliated with CrossFit, Inc. nor does it provide CrossFit work-outs. Although WOD at Home may apply to be affiliated in the future, currently WOD at Home offers a world-class strength and conditioning program created by experienced coaches and has no official relationship with CrossFit, Inc.. If you are looking for CrossFit, please check out the affiliate finder map to find an affiliate in your area. There is no substitute for a great gym and great coaches. The experience, motivation, and community a good gym can bring to your personal health and fitness is unrivaled. But, with high gym membership fees and limitations in your personal life, there are many reasons one may choose to WOD at Home (WOD = Workout of the Day). Once someone has made the choice to start doing a weight training program at their home, in their garage, yard, or at the park, there are a lot of benefits of a local gym they miss-out on. During a workout at a quality gym, you put your fitness in the hands of your coach. You depend on them to teach you how to workout, form and technique for the exercises as well as guide you through their local weight training program. Their weight training program may seem random to someone not paying close attention, but there is a lot of thought and planning that goes into a good gym’s calendar of workouts (Also known as their programming). Learning how to workout at home and trying to follow that weight training program can be difficult due to restricted equipment, exercise instruction, and just being confused about exactly what you are supposed to do. Centered around cardiovascular endurance, gymnastics, power-lifting and Olympic weightlifting, WOD at Home gives you a complete workout program / weight training program to follow with the assumption that you are working-out at home and have limited equipment at your disposal. Each day, WOD at Home gives mobility exercises to perform, a dynamic warm-ups a workout, a cool-down, exactly how to substitute the exercises depending on the equipment you have and your fitness level, and links to videos explaining and teaching the exercises needed for that day. There is a virtual class agenda that steps you though exactly what to do each day at home for the weight training program in a way that you can easily fit into your schedule. It is not a 90 day weight training program that ends and leaves you scrambling to find what’s next. Simply follow the constantly varied, WOD at Home workout of the day and get ready to work hard and see drastic results. WOD at Home was created by two garage gym athletes who followed various workout programs and weight training programs, who now own and operate their own successful gym in Austin, TX. Remembering back to their garage gym days and the difficulties they ran into trying to follow any type of legitimate weight training program at home with the equipment they had, they created WOD at Home. In their garages, they would search endlessly for effective workouts that were good for the home gym, but with that randomness, there was no structure to the weight training program they followed…actually, no real program at all. WOD at Home is never ending and updated daily with fresh workouts. Although they may seem random, years of experience and collaboration goes into the order and types of workouts provided to maximize results. WOD at Home wants you to be good at everything without focusing too much on one or two specific things. By cycling exercises and constantly changing what each workout is trying to accomplish, you will have time to develop competency with exercises, make gains, and move on, so there is no plateau. Be ready to work hard and attack your weaknesses to earn increased body composition, lean muscle mass, higher energy through-out the day, and just being awesome at life. Why choose WOD at Home? Detailed pictures and links to videos explaining each of the exercises in the WOD, so there are no questions about how to workout at home, if you are doing the correct thing, or if you are performing it safely. Daily WOD Posts: No longer worry about trying to follow different work-out programs and figuring-out equivalent substitutions and scaling for exercises with the equipment you have. Let WOD at Home explain how to workout with a fitness programming that fits your needs with daily workouts created by experienced coaches with the limitations of home gym equipment in mind. Take out all the guess-work with daily scaling options for different equipment and fitness levels, links to videos, and have a proven workout program with a purpose at your fingertips. Simply log-on to WOD at Home and follow the workout of the day to benefit from diverse, high-intensity workouts…Read More.